Custom Conveyor Systems | Products | BGRS, Inc.
BGRS has been a manufacturer of Airbelt Custom Conveyor Systems since 1980. We can construct replacement and spare parts for equipment previously constructed by BGRS, or can custom build specialty parts. BGRS can construct your bulk belt conveyor frame and support bent fabrication. We can coat and assemble your design to your specifications. 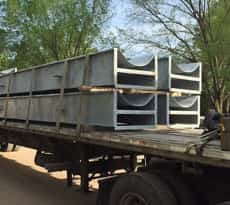 BGRS can construct custom discharge and inlet loading chutes to your specifications as well.